skiing tracks and skating trails in Norway, Sweden, across the European Alps, in North America and Worldwide. Variously also known as XC skiing, langlauf, ski de fond and sci di fondo, this type of skiing uses lightweight shoes and narrow cross-country skis without metal edges (skinny skis), or specialised skating skis. Alpine and Telemark ski touring and expeditions, Nordic and cross-country skiing, and instruction courses covering backcountry skiing skills and avalanche safety – in New Zealand's most spectacular winter wilderness locations. Cross-country skiing in Scandinavia and various European centres. Accompanied cross-country skiing programmes with full support from a resident Headwater leader or with professional ski tuition included – but with lots of scope for independent exploring on groomed, easy-to-follow trails. Opportunities to also try snowshoeing, winter walking and sledging too. A dedicated cross country skiing village in New England with a hundred miles of cross country ski trails, lessons and ski school available daily, lovely village atmosphere, and range of lodging from B&B to country hotels. Maintained by the community based non-profit Jackson Ski Touring Foundation. Kitzbühel offers more than 500 km of cross-country skiing routes spread throughout the area, including over 60 km of groomed nordic tracks for cross-country skiers and skaters, floodlit track with its own snow-making system, and the Kitzbüheler Horn high-altitude track at 1,600 m.
Cross country ski holidays (aka langlauf in Austria or ski de fond in France) for all levels of experience and fitness. lnghams offer Learn to Cross-country beginner packages in Seefeld (Austria), and Levi, Saariselkä and Ylläs (Lapland). Smaller resorts also include: Mayrhofen (Austria), Soldeu (Andorra), and Breckenridge and Jackson Hole in the USA. 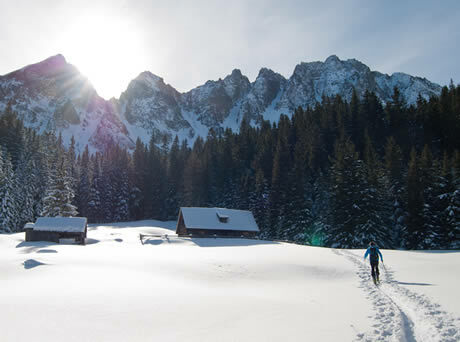 Cross-country skiing holidays including ski instruction in classic and skating techniques and optional opportunities to take part in ski marathons and races. Holiday cottage and group accommodation offering some of the best cross country skiing in Scotland. Offering Nordic/cross-country ski classes suitable for everyone from the novice just starting out to the expert wishing to improve on existing skills. The Telemark Ski Company operate specialist instructional courses and tours in Nordic, Telemark and cross country skiing led by highly qualified instructors. Telemarking and freeheel skiing and ski touring in Scotland, Italy, France, Sweden and Norway and beyond. A regularly changing selection of skiing, snowboarding and other snow based trips, holidays and tours worldwide. Including a selection of cross-country skiing options, including various destinations in Austria and Norway, cross-country ski trips in the Spanish Pyrenees and Slovakia's High Tatras or the ultimate cross-country skiers trip to join the Engadin Ski Marathon! Cross country skiing, walking, cycling and wildlife holidays in Bareges in the French Pyrenees. The Norwegian Mountain Touring Association (DNT) operate an excellent system of mountain huts and organise cross country and ski touring trips. Ski outfitters and guides with backcountry ski huts and yurts in the mountains near Sun Valley, Idaho. Levi is Lapland's most popular cross country ski resort and is snow-sure from November to May. The cross country ski area is regarded as one of the best and is the most extensive in Finland, with 230 km of maintained cross country ski tracks offering uncrowded skiing in an area of exceptional natural beauty. It's ideal for all ability levels, offering plentiful refreshment huts and unlimited trails. Some of the ski tracks are also lit at night. Levi offers an impressive range of accommodation, from hotels to cabins and cottages; as well as a wide choice of good restaurants and cosy bars. There's also a good chance of seeing the Northern Lights and an extensive choice of other activities, including reindeer, husky and snowmobile safaris, or overnighters in a luxury glass igloo. A cross country holiday based in the picture-postcard Swiss village of Kandersteg, in the heart of the Bernese Oberland. Kandersteg is a superb choice for skiers of all ages and abilities, with its combination of high trails and open plateau and well-marked, easy-to-follow routes. To get you started there are three half days of tuition, after that you are free to explore independently or book additional lessons. Accommodation is in a friendly hotel with excellent cuisine, an indoor pool, sauna and gym. What are the options if you want to try out cross-country skiing before going on a holiday, or are just looking for some UK based training? During the winter the Scottish ski resorts offer cross country options of course, but there are possibilities further south too. The Christmas Adventure winter season, Nordic cross country skiing trail in Yorkshire is one idea, it is only 1.2 km long, but that's long enough to give things a go and get the feel for cross country technique – and the track itself is artificial so there's no need to wait for a snowfall! Further north you can do the same thing all year round at Huntly Nordic and Outdoor Centre in Aberdeenshire. The centre is the UK's only all-weather, purpose-built centre for cross-country and Nordic skiing. Tuition for all levels is available on day and weekend courses. Another way to do it is by roller skiing – this is cross-country skiing without snow, using wheeled roller skis on surfaced trails and tracks. Rollerski.co.uk run day courses in and around London teaching the basic roller ski/cross-country technique to help prepare people for snow skiing. 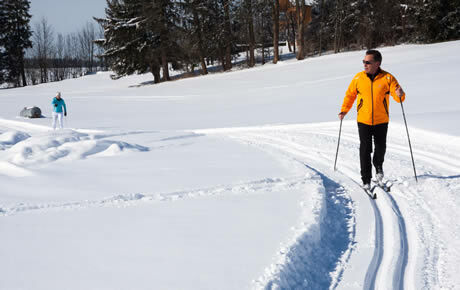 The travel-quest cross-country track skiing holidays and courses lists holidays, vacations, courses, weekends, tours and short breaks where the main activity and focus is on cross-country skiing on groomed cut trails using free-heel 'skinny' skis without metal edges. Techniques will include skating, classic technique using diagonal stride/gait, and freestyle techniques, X-country skiing, langlauf, ski de fond holidays may also include opportunities for racing, ski marathons, and biathlon (skiing and rifle shooting). We have separate sections for Nordic (backcountry) ski touring, telemarking and skijoring.